Who doesn’t appreciate quality fishing gear? (I thought so….) Quality gear is often—and wrongly—associated with a fat budget, but that’s just plain wrong. Here’s proof. 2012 has been a banner year for new fly fishing products, but I thought that more than a few products were over-hyped, and many others simply got buried in the media storm. The following items are a few gems that went somewhat unnoticed or just weren’t trumpeted loudly upon release. These items will build a strong and dedicated following in due time. I have little love for the trend in reel design this year, and even feel that one major manufacturer has lost its way. That said, there’s one new product that’s a standout: Abel’s 4/5/6 Classic. 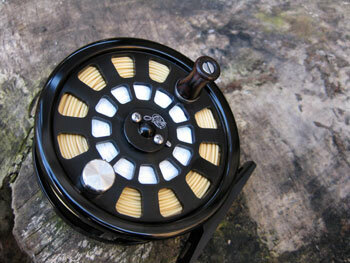 Anyone familiar with Abel’s spey reels will note that the Classic is a scaled down version of that product. Abel literature puts it best: “classic looks,with a state-of-the art build and materials.” The smartly designed and externally adjustable, 8-setting pawl/overrun system will make any dedicated fresh water junkie take note: finally, a reel manufacturer with the fortitude to design, build and market a double pawl reel that you can confidently stalk large fish with. Comes in ported or solid configurations, depending on just how classic a look you’re aiming for. As with all Abel products, the 4/5/6 features flawless machining and a second-to-none anodization process. Requires minimal, DIY maintenance, and begs to be paired with a classic fly rod. Such as…. RL Winston’s GVX Select, which turned out to be a big surprise, mainly because a competing brand garnered nearly all of the headlines over the past year, so the GVX seemed to have slipped under the radar. If you get a chance, I urge you to give this rod a try. To my mind, no other graphite rod in the recent past has provided this much character for its (mid) price range: top-tier hardware, pleasingly smooth, powerful and a classic feel. So relax that cast, count a little slower on those longer ones, and the GVX’s attributes will come shining through. Graphite has been a victim of over-engineering in the last few years: many fly rods just feel and act the same, so it’s great to find the odd rod that is well-engineered yet harkens back to an earlier, softer action. Final note: the GVX Select is deadly accurate. Enrico Puglisi flies. I did a double-take the first time I saw a group of EP freshwater flies lined up in a shop display. A typical product description goes like this, “Everglades SP sports natural looking colors, a healthy profile, monofilament weed guard and realistic eyes all tied together on a sharp Gamakatsu hook,” but there’s far more to these flies than that. Innovative designs, and top-tier materials and craftsmanship are what these little gems are all about. Many of the designs are strikingly minimalist and imitate the various shrimp, crabs and baitfish that populate backcountry mangroves. 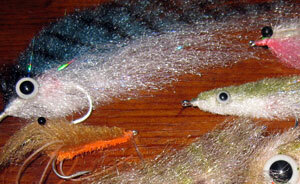 I read several product reviews and there’s a clear consensus: EP flies are magnets for snook, redfish and tarpon. I purchased my first Puglisi flies only one year ago and I’ve learned that they’re among the most durable flies available. Sold separately or as target-specific selections. If you’re budget is a little more modest, there’s still a way to give high quality gear. Pick up a fresh batch of quality leaders as a stocking stuffer. RIO’s new SuppleFlex trout leaders are obsessively designed and calibrated to produce a perfectly balanced leader formula. The supple nature of the material allows for featherweight presentations and does not impede the natural movement of a fly in the current. No other leader like this currently exists on the market. In my mind it’s the ‘go to’ leader for dry fly/soft hackle experts. Oh, and one last thing: a little on-the-water etiquette would be nice (total cost: $0). It’s something we all read about from time to time, but practice too seldom. I’m no Mr. Perfect and have certainly been guilty of a few minor infractions over the past season. Whether you’re a newbie or a fishing pro, take a little time to learn or review the rules of being a considerate fellow angler. We all stand to benefit.